I was put off of seeing this movie when it first came out because it just looked like The Hangover – but the female version. However, after seeing a few scenes of it over the last couple of years, I decided to buy it in the sales. And boy am I glad! I haven’t laughed this hard in ages! It is a truly hilarious journey that these wacky characters go on – any one of them could have been the leading lady. Nothing is going well for Annie (Kristen Wigg). Her bakery closed down due to the recession, she’s in her mid-30s and a hopeless spinster. Thankfully she still has her best friend, Lillian (Maya Rudolph). Annie gets her heartbroken, however, when Lillian gets engaged and in the process of planning her wedding, finds a new best friend named Helen (Rose Byrne). Helen appears superior to Annie in every way. Their rivalry eventually gets Annie kicked out of the wedding planning. Their friendship is so well portrayed – I swear they must be best friends in real life, with the quirks and inside jokes that anyone who has had a super close friend will recognise. Anybody who has had a close friend move away or move on will totally get the pain and loss that Annie experiences in this. Unlike many comedies, the characters in Bridesmaids are more than two-dimensional. They are all relatable or recognisable. The characters – including the loyal yet totally bizarre Megan (Melissa McCarthy) who is absolutely hilarious, straight up and blunt – are amazing. Megan: I fell off a cruise ship… I’m not gonna say I survived, I’m gonna say I thrived. I met a dolphin down there. I swear to god that dolphin looked not at me, but into my soul, into my goddamn soul Annie, and said ‘I’m saving you, Megan.’ Not with his mouth, but he said it… I’m assuming telepathically. Kristen Wigg is an incredible actor. After seeing her in Whip It I thought she was pretty cool, but her performance is so convincing in Bridesmaids that she is definitely one of my new favourite actors. Passenger on plane: I had a dream last night that we went down. It was terrible… You were in it. A ton of crazy hilarious events happen along the way. Including food poisoning (which was actually super gross…), as well as very interesting encounters with Annie’s room mates, siblings Brynn (Rebel Wilson – I love her in Pitch Perfect) and Gil (Matt Lucas). The soundtrack is pretty awesome, with a song that I first heard on Bridesmaids (that has now put on repeat) called Paper Bag by Fiona Apple. Check it out! This film is clearly not for everyone though. It has a decent amount of swearing and a lot of sexual references so be careful who you watch it with. It is a hilarious story that is written and performed extremely well. Can I just say that half of the dialogue in this trailer is not actually in the film… Nevertheless, the facials in this films are so funny! 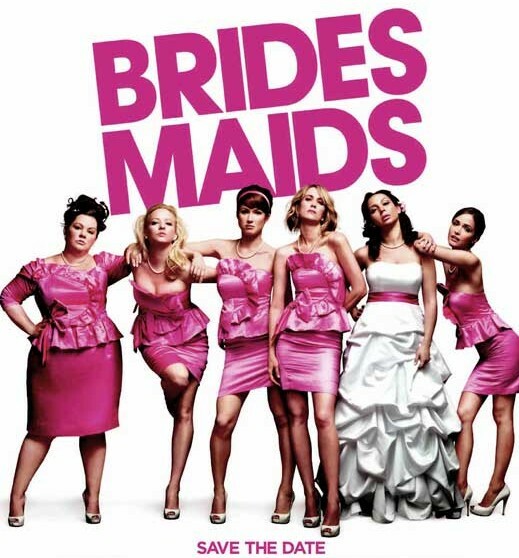 Gallery | This entry was posted in All Film Reviews, comedy, Date Night Movies, Editor's Pick, Girls' Night Movies and tagged 2011, bridesmaids, Chris O'Dowd, comedy, Ellie Kemper, Jill Clayburgh, Kristen Wiig, Maya Rudolph, Melissa McCarthy, Rose Byrne, the hangover, Wendi McLendon-Covey. Bookmark the permalink.